Subject: Plate: Blut und Blutbewegung I. (Blood and blood movement I). 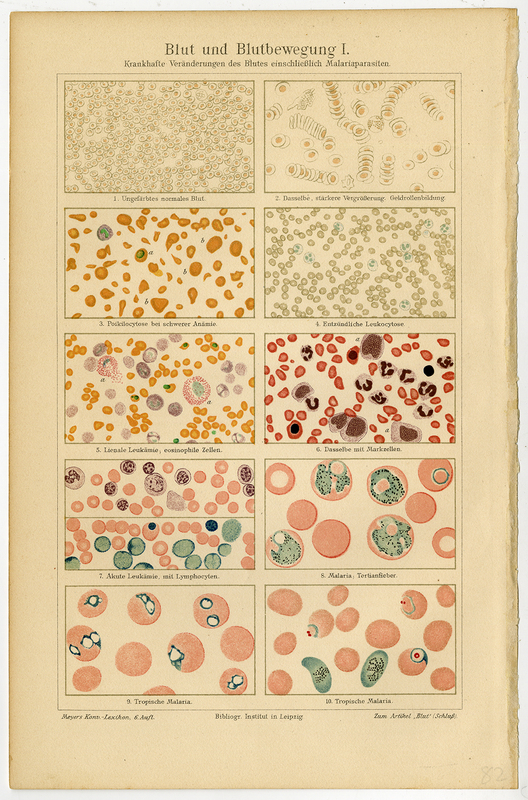 This plate shows the pathological changes in blood and malaria parasites. Plate form the 6th edition of Meyers' Konversationslexikon. Condition: Excellent, given age. Margin edges faintly browned. General age-related toning and/or occasional minor defects from handling. Please study scan carefully. Medium: Original chromolithograph on a vellin type paper. Size (in cm): The overall size is ca. 16 x 24.5 cm. The image size is ca. 12.7 x 21.4 cm. Size (in inch): The overall size is ca. 6.3 x 9.6 inch. The image size is ca. 5 x 8.4 inch. Description: This original print originates from the sixth edition of the famous German encyclopedia Meyers' Konversationslexikon, and was published 1902-1920. Meyers Konversations-Lexikon was a major German encyclopedia that existed in various editions from 1839 until 1984, when it merged with the Brockhaus encyclopedia. The same prints were used for similar publications, such as Brockhaus' encyclopedia, and the Dutch encyclopedias of Oosthoek and Winkler Prins. Artists and Engravers: The original founder and publisher who initiated this famous encyclopedia was Joseph Meyer (1796-1856, Hildburghausen, Germany).